MY knowledge of Primitive Methodism is not so extended as that of many, but still it is something to be able to look back upon nearly half-a-century’s acquaintance with many of its ministers and methods, and recall a few interesting incidents associated with its church-life and work over that somewhat lengthened period. It is well known that the Connexion in its early stages, as well as in more recent times, owed not a little to the zeal, perseverance, and self-sacrificing labours of many godly women, as well as men; women who were not afraid to take their stand at the market-cross, or in the back alley, on the open field – anywhere and everywhere, wherever they could find standing room and people to listen – and proclaim to the perishing mobs and multitudes around them God’s message of mercy and love, fearless of consequences. And a more frequent use of these means and methods, we often think, would be of immense advantage to many of our churches to-day, and would help forward the Kingdom of Jesus Christ wonderfully amongst the teeming masses of many of our large towns and cities. God forbid that we should ever become too respectable for open-air work. My first acquaintance with Primitive Methodism was brought about by the announcement that a female would preach at Thurgoland, in the Barnsley circuit, as far back as 1853. I was but a lad then, but I well remember how my curiosity was so aroused that I determined, with several other lads, to see and hear the woman preacher. Her name was Martha Taylor, a native of Middlestown, near Wakefield. She was a little woman, gentle and ladylike in manners, not very strong in voice, but remarkably fluent in speech, and became immensely popular as a preacher for anniversaries and other special occasions. Her sermons were mostly of the Evangelistic order, and were delivered with an earnestness and zeal evidently born of the baptism of the Holy Ghost, and were often made a great blessing both to saints and sinners. Indeed, it was under a sermon she preached from the text, ‘Prepare to meet thy God,’ that I was first awakened to a sense of my need of salvation, and ultimately led to give my heart to God. She died in the faith many years ago at Roystone, near Barnsley, and her spirit now rests with God. Ellen Littlewood I also remember. She was from Scholes, near Huddersfield, and commenced preaching when in her teens. She was tall, with cheeks like roses, and a soul full of new-born zeal. Her sermons, too, were of the revivalistic type, and she was made a great blessing in the Barnsley and neighbouring circuits. She is still in the flesh, but must, in the natural order of things, be getting near the ‘end of the way.’ May her sun go down in a clear westerly sky, and her victory of the last enemy be complete and triumphant. After I entered the ministry in 1862, it was my privilege to meet with other and older female preachers, whose services extended far back into the early days of our Church, and who were often in labours abundant, in perils many, and in sufferings not a few; but who, like the Apostle Paul, counted not their lives dear unto themselves, if only they might win souls for Christ. It was always interesting to hear these sisters talk about long journeys, rough roads, rainy days, and dark nights, which they always minded to say made no difference to them in regard to their appointments on the plan. God having given them a message, they evidently felt it must be delivered at any cost. Some run before they are sent, and therefore have no message. But certainly that could not be said of these women. The first I will mention is a dear old sister I found in a very remote corner of the Malton Circuit, nearly forty years ago, when I commenced my probation. She was known all round the country side as, ‘Old Jane Simpson, of Skewsby.’ Her name had been on the plan nearly fifty years, and she had often stood side by side in the dales and the wolds with the Garners, the Kendalls, and many others of the fathers and early pioneers of the Connexion. It was always a real means of grace to hear her recount the battles fought and victories won in the interests of Christ’s kingdom and Primitive Methodism. She was no believer in following the fashions of the day, but a strict observer of plainness of dress. The old-fashioned frill-cap and quaker bonnet were her principal headgear, and here other garments were equally plain and homely. Her husband, too, was one of the plain sort, and the pair, as they sat together in their quiet home, were a real picture. For many years they entertained the young preacher when out on that side of the circuit, and one had therefore many opportunities of knowing them well, and sharing their kind hospitality. To spend an evening with them, and listen to their many stories of bygone days, was ample compensation for a journey of twelve miles. Both have long since gone beyond the shadows, into the clear beautiful light of God’s glorious presence, to be for ever with the Lord. There is another female preacher in this circuit whose name it would almost be a sin not to mention. Rachel Fawbert was no ordinary woman. Her name and memory are still green and fragrant both in town and country. Her christian character and deep-toned piety endeared her to all who knew her. Indeed, she was greatly beloved, not only by our own people, but by those of other churches. And even the ungodly gossipers at the street corner had great faith in Rachel’s goodness. Her zeal, devotion, and child-like faith in God were seldom equalled. 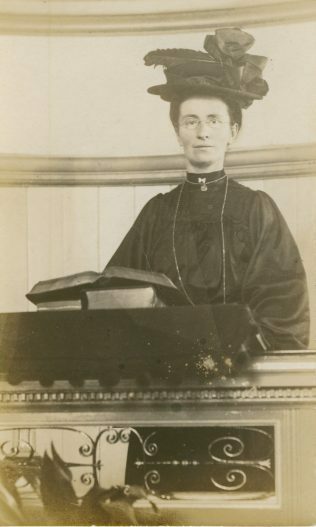 She was not greatly gifted as a preacher, but, like Johnny Oxtoby, she was mighty in faith and prayer, successful in leading sinners to the Saviour, and many will no doubt be the ‘Crown of her rejoicing’ at the last day. She never made a practice of announcing a text, but used to read a chapter, or some particular Bible narrative, and make it the basis of her discourse. She had many remarkable answers to her prayers, but one must suffice here. She and another sister of kindred spirit spent a whole night in prayer for a new chapel at Old Malton, where for many years our cause had suffered through lack of suitable accommodation. Many difficulties stood in the way, but Sister Fawbert had not lost faith in God’s promises and power. The parson, the squire, and of course, his Satanic majesty were all opposed to a new Primitive chapel, and determined it should not be. But God is wiser and mightier than either parson, squire, or the devil, and marvellous to say – and yet not marvellous – faith and prayer prevailed. In a very short time a most eligible site was secured from a very unlikely person, and a neat commodious sanctuary was erected in the centre of the village in which the writer had the honour of preaching many times. Surely Satan overshoots his mark sometimes; or undershoots it; or shoots by the side of it; anyhow, he misses it, and out of cruel and fiendish oppositions have often come victory and success. Rachel finished her earthly course a few years ago with her only daughter at Darlington, and died in great peace. Some of her sons are local preachers with us, and evince much of the zeal and earnestness which all through life characterised their now sainted mother. In 1866, I finished my probation in the Pickering circuit. Here, also, I made the acquaintance of female preachers of early times, who, I learned, had done much hard work in seeking to establish and extend Primitive Methodism in that romantic part of north-east Yorkshire. Mrs. Swales, mother of the Rev. John Swales, of Bingley, deserves honourable mention here. Her conversion must have dated far back into the early days of our Church. It is nearly thirty-four years since I first saw her, and she seemed then to have passed the meridian of life, and was going calmly and trustfully down the other side. She began to preach when very young, often walking many miles through wind and rain and storm to carry the gospel message into the surrounding dales and moors. Full of revival fire, zeal, enthusiasm, and Christlike passion for souls, she was instrumental in leading many to the Saviour, and helping in no small degree to stimulate and strengthen our churches in many of the adjacent villages. She and her husband stood nobly by our cause in the town when foes were many and friends few. Their home often afforded shelter and succour to the early preachers; and in later times it was often not unlike a little Bethany, where many weary feet found rest, and Christian hospitality was extended to God’s servants in no stinted measure. Both, however, have finished their work, and now enjoy the rest that remains to the people of God. John, their only son, has spent over thirty useful and successful years in our ministry, having laboured on some of the most important stations in the Leeds and York, and Bradford and Halifax districts. Polly, their youngest daughter, whom it was my joy to lead to the Saviour in her girlhood days, is also in our ministry as the wife of the Rev. W.A. Eyre, and has done much hard work for the Connexion as Sunday school teacher and class leader. Instead of the fathers and the mothers come the sons and the daughters, and the work commenced by the former is continued by the latter, and so the Kingdom of Jesus Christ spreads and grows and prevails. Another name is also worthy of mention here. Mrs. Fletcher, whose maiden name was Miss Patrick, was born and brought up in Pickering, and converted when very young. She, too, began to preach when in her teens, and was made a great blessing to scores in the surrounding villages. Being revivalistic in her methods, and full of the Holy Ghost, she was fairly successful in the converting work, and was in frequent demand for special evangelistic services. She was a good preacher, earnest worker, and will no doubt have a goodly number of sheaves to bring in at the last. I understand she is still living, but must be getting near the border-land. May her last days be her brightest and best, her passage over Jordan calm and serene, and her entrance into the everlasting kingdom of our Lord Jesus Christ abundant. There is just one other name I feel I ought to mention, notwithstanding the fact that it has already been referred to in the Messenger by the Rev. Joel Hodgson. I wish simply to supplement what he has said respecting Miss Chantrey, of Alford, Lincolnshire. I made her acquaintance in the year 1885, and was pleased to find her with her feet still on The Rock, but sorry to discover that her name had dropped off the plan. This, I ascertained, had come about, not in consequence of any misconduct on her part, but through some little misunderstanding between her and the officials and superintendent of the circuit at the time. But as most of the parties concerned are now where mistakes never happen, we may fairly assume that whatever differences existed between them here will no doubt be rectified now. I found Miss Chantrey quite an invalid, and almost blind, but with the old Primitive fire still burning in her soul, and she never seemed to tire of talking about the days and the doings of the past. I visited her almost weekly, and my visits were much appreciated. Happily she had no worry or anxiety about temporal matters in her last days. A kind Providence had evidently smiled upon her in her declining years, and she went to heaven without having to be snubbed by any poor law officer, or threatened to be run into the ‘House.’ Her interest in Primitive Methodism remained with her to the last, as the following incident will show. The Alford Trust at this time was in a seriously burdened condition which caused the trustees much worry and fear. Miss Chantrey, too, was much concerned about it, and expressed to me a wish to render some financial help, and thus make the burden lighter to carry. I said, What would you like to do, Miss Chantrey?’ Her first thought was to give £100. But after further consideration, she said, ‘Mr. Spensley I have decided to make it £200, and the trustees shall pay me £8 a year as long as I live, and at my death, principal and interest shall die also.’ I had the matter at once arranged by a legal document, and not many years after she finished her earthly career, ‘being old and full of days,’ but ripe and ready for the Heavenly garner.